Archbishop Charles Chaput greets parishioners young and old at St. Malachi Church's 175th anniversary Mass July 7. This excerpt from the book “Echoes in the Glen: St. Malachi of Doe Run” by Kathleen Hood graces the inside of the front cover of a booklet marking the 175th anniversary of St. Malachi Church in Cochranville, Chester County. 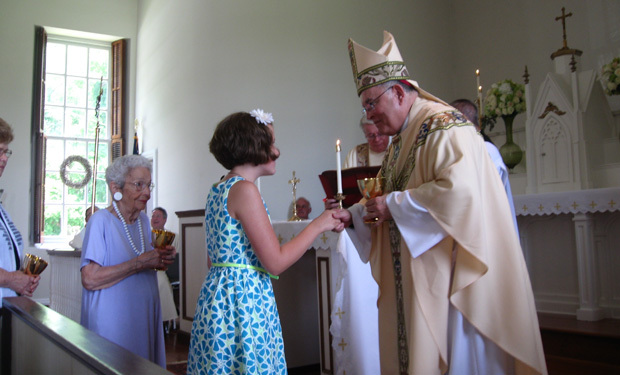 Archbishop Charles J. Chaput was the principal celebrant of an anniversary Mass July 7 at the church, which was followed by a Celtic celebration on the grounds. St. Malachi is a mission church (where Mass is celebrated at 10:30 a.m. each Sunday) of Our Lady of Consolation Parish in Parkesburg, which will celebrate its 160th anniversary in September. Father Victor J. Eschbach, pastor of Our Lady of Consolation, and principal concelebrants rode to the church via horse and carriage, symbolic of the Jesuit priests who sporadically rode into the area from Delaware, Maryland and Philadelphia to celebrate Mass in barns and fields prior to the church’s completion in 1838. In the late 18th and early 19th centuries, Catholics scattered throughout the area between Cochranville and the Susquehanna River would follow the horse and carriage, knowing that it meant Mass would be celebrated. “These immigrants were primarily from Northern Ireland and came up to Pennsylvania from the Chesapeake Bay through Cecil County” in Maryland, said Father Eschbach. The rolling green hills of this bucolic valley in Chester County, known as Doe Run, truly reminded them of their homeland. Concelebrants of the Mass included Scheutist Father John Van de Paer, retired pastor of St. Charles Borromeo Parish in Philadelphia now residing at Our Lady of Consolation, Msgr. Kevin C. Lawrence, pastor of St. Malachy Parish in Philadelphia, Msgr. Joseph P. Gentili, pastor of Our Lady of Guadalupe Parish in Buckingham, Msgr. Francis J. Depman, pastor of St. Rocco Parish in Avondale, Msgr. Patrick E. Sweeney, pastor of St. Eleanor Parish in Collegeville, Father Michael J. Fitzpatrick, pastor of St. Peter Parish in West Brandywine, Father Michael F. Hennelly, pastor of Queen of the Universe Parish in Levittown, and Norbertine Fathers Ronald J. Rossi and Thomas J. Rossi, weekend assistants at Our Lady of Consolation. After Mass, it was time to dance and celebrate the church’s Irish roots. Starting with performances by bagpipe bands from Lancaster, Philadelphia and Wayne, members of St. Malachi and parishioners of Our Lady of Consolation set the tone for the afternoon’s events. This was followed by a Celtic concert by The Fair Trade Irish folk band of Philadelphia. Despite temperatures in the low 90s, parishioners sang along and danced barefoot in the grass of the church’s one-acre grounds. “All my children were baptized here at St. Malachi and my memories of this little church are full of joy,” said Patty Sheridan, an Our Lady of Consolation parishioner and mother of four. Historically, in the 1790s the Maguire family donated one acre around the grave of their relative Thomas, who died of tuberculosis in 1771. After several failed attempts to construct a church in the early 1800s, a building was finally completed in late 1838, and the first Mass was celebrated on January 1, 1839. The small congregation stood for the entire Mass, as there were no pews. Today the church is listed on the National Register of Historic Places as one to the oldest standing churches in Chester County. From 1974 to 1993, innovations such as electricity and central heating were installed in the church under (then) pastor Father George P. Schneider. In 1994, Father Eschbach continued Father Schneider’s upgrades to St. Malachi. As a result of witnessing “wilting brides” and “melting grooms,” he had air conditioning installed in the country church. In 1996 Father Van de Paer, C.I.C.M., arrived as a resident and saw to further renovations, such as indoor plumbing and a well. “It was a labor of love for a church and congregation that still stand as a testament of lasting faith,” said Father Van de Paer, now 93 and still active in the parish. Among some of the notable celebrations that have happened at St. Malachi Church were the celebration of the sacrament of confirmation by St. John Neumann (who reportedly slept behind the altar overnight during his visit) on Oct. 26 and 27, 1856, and the funeral Mass of beloved Philadelphia Phillies pitcher Tug McGraw in January 2004. George Gregory is a freelance writer and a member of Our Lady of the Rosary Parish, Coatesville. 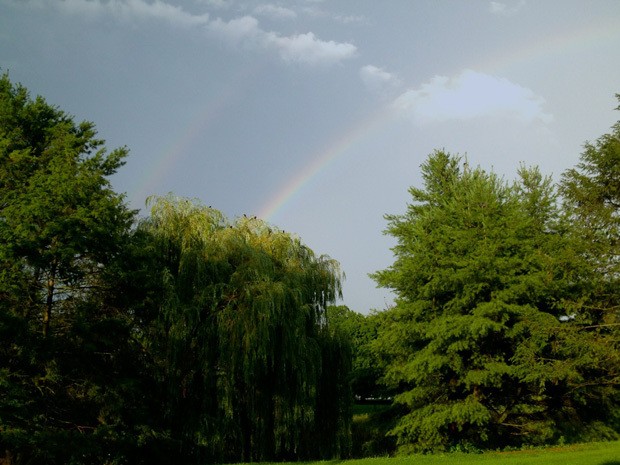 At the close of festivities marking the 175 anniversary of St. Malachi church July 7, a double rainbow appears in the sky over the tiny Catholic church in the bucolic Chester County countryside. My daughter-in -law family is buried there.Her great grandparents lived there & were farmers.That is the second time we were there. A beautiful place of rest. It reminded me of Doe Chapel & cemetry in Ireland where both sides of my family are buried.